Enjoy recreational amenities such as a spa tub and a sauna. Additional features at this motel include complimentary wireless Internet access and tour/ticket assistance. Make yourself at home in one of the 70 guestrooms. Complimentary wireless Internet access keeps you connected, and satellite programming is available for your entertainment. Private bathrooms with bathtubs or showers feature complimentary toiletries and hair dryers. Conveniences include desks, as well as phones with free local calls. 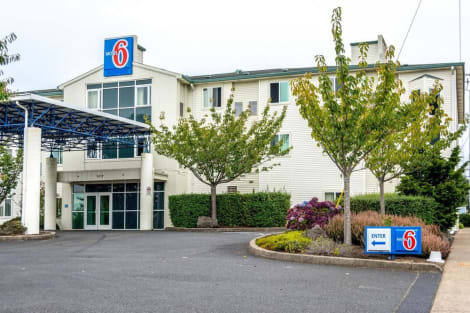 With a stay at Inn at Lincoln City in Lincoln City, you'll be near the beach, within a 10-minute drive of Chinook Winds Casino and Lincoln City Cultural Center. This hotel is 12.5 mi (20.2 km) from Whale Watching Center and 0.7 mi (1.1 km) from Tanger Outlet Center. Enjoy affordable rates at a convenient location in this well-appointed hotel. Travellers will find many local attractions and points of interest within easy reach, including the renowned Chinook Winds Casino. The magnificent Devils Lake State Park is just a short drive away and the Drift Creek Covered Bridge is also well worth a visit. The hotel is conveniently located close to local educational facilities and shopping malls. The spacious, well-appointed guest rooms all feature cable television and free Wi-Fi as well as handy coffee-makers. Other amenities include a complimentary continental breakfast every morning to start the day in style and free local calls to say in touch with friends, family and business associates. Guests can take care of basic business needs with access to copy and fax services and take advantage of the convenient free onsite parking. Take advantage of recreational opportunities offered, including an indoor pool, a spa tub, and a sauna. This hotel also features complimentary wireless Internet access, concierge services, and gift shops/newsstands. If you're ready for some gaming fun, you can hop on the complimentary casino shuttle. Relax at the full-service spa, where you can enjoy massages and body treatments. You're sure to appreciate the recreational amenities, including an indoor pool, a spa tub, and a sauna. Additional amenities at this hotel include complimentary wireless Internet access, concierge services, and gift shops/newsstands. Guests who want to try their luck at the slots can hop on the complimentary casino shuttle. lastminute.com has a fantastic range of hotels in Lincoln City, with everything from cheap hotels to luxurious five star accommodation available. We like to live up to our last minute name so remember you can book any one of our excellent Lincoln City hotels up until midnight and stay the same night.